Here's some cool behind the scenes Star Wars information that you might want to know! 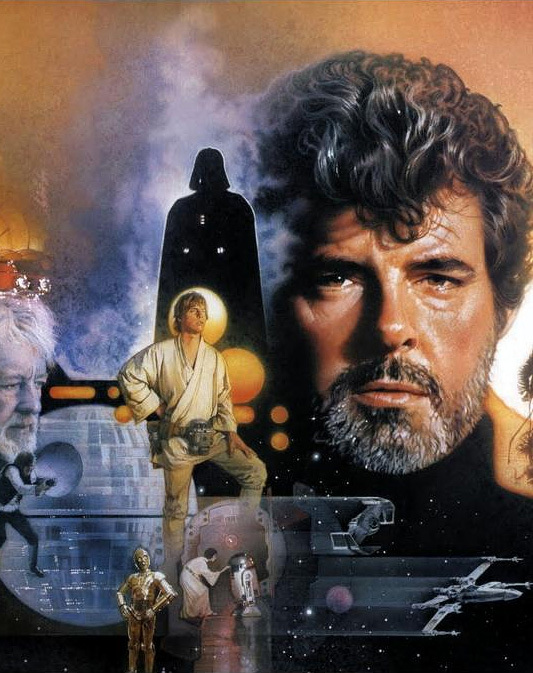 Back in 1981, George Lucas, Lawrence Kasdan, Richard Marquand, and Howard Kazanjian mapped out the Star Wars prequel story and the fall of Anakin Skywalker during a story conference for what was then titled Revenge of the Jedi. Return of the Jedi turns 30 years old soon, and a transcript from that meeting was posted on the Huffington Post, which is an excerpt from J.W. Rinzler's upcoming book The Making of Star Wars: Return of the Jedi. There's a lot of great little details here. There's stuff we saw brought to life in the prequels and other things that ended up being changed. For example, Lucas goes through and breaks down the relationship between the Emperor and Vader, which is essentially beat-for-beat from what we saw in the prequels. He also explains how Yoda is not really a full fledge Jedi Knight. He was originally never supposed to fight. He was supposed to be more of a guru and a teacher. What's funny is Kasdan was kind of in shock by the news. I couldn't help but laugh at his reaction. The Force is actually explained differently. At one point, the Force was something anyone could have. It wasn't based on a person's midi-chlorian count. It was something anyone could tap into, Lucas explains it as being like Yoga. This is a really entertaining and eye opening read, and you can check it out below! Note: Many of the ideas here are conceptual only and should not be considered as canon in the Star Wars saga. Lucas: Anakin Skywalker starting hanging out with the Emperor, who at this point nobody knew was that bad, because he was an elected official. Kasdan: Was he a Jedi? Lucas: No, he was a politician. Richard M. Nixon was his name. He subverted the senate and finally took over and became an imperial guy and he was really evil. But he pretended to be a really nice guy. He sucked Luke’s father into the dark side. Lucas: Well, anyway, Luke’s father gets subverted by the Emperor. He gets a little weird at home and his wife begins to figure out that things are going wrong and she confides in Ben, who is his mentor. On his missions through the galaxies, Anakin has been going off doing his Jedi thing and a lot of Jedi have been getting killed—and it’s because they turn their back on him and he cuts them down. The president is turning into an Emperor and Luke’s mother suspects that something has happened to her husband. She is pregnant. Anakin gets worse and worse, and finally Ben has to fight him and he throws him down into a volcano and Vader is all beat up. Now, when he falls into the pit, his other arm goes and his leg and there is hardly anything left of him by the time the Emperor’s troops fish him out of the drink. Then when Ben finds out that Vader has been fished out and is in the hands of the Empire, he is worried about it. He goes back to Vader’s wife and explains that Anakin is the bad guy, the one killing all the Jedi. When he goes back his wife, Mrs. Skywalker has had the kids, the twins, so she has these two little babies who are six months old or so. So everybody has to go into hiding. The Skywalker line is very strong with the Force, so Ben says, “I think we should protect the kids, because they may be able to help us right the wrong that your husband has created in the universe.” And so Ben takes one and gives him to a couple out there on Tatooine and he gets his little hideout in the hills and he watches him grow. Ben can’t raise Luke himself, because he’s a wanted man. Leia and Luke’s mother go to Alderaan and are taken in by the king there, who is a friend of Ben’s. She dies shortly thereafter and Leia is brought up by her foster parents. She knows that her real mother died. I can't wait to get this book so I can read more!